Welcome to our initial Legacy Metagame Analysis. This will be a monthly series of Legacy metagame reports covering all of the major tournaments, showing which decks are grabbing the top finishes. I have been doing my own metagame analysis for months now, and I find it really helpful as a bird’s eye view of what is performing well in Legacy. First off, I define major tournament as tournaments with 8+ Swiss rounds (129+ players). I primarily use mtgdecks.net as my source, from across the globe. I define top finish as (number of players) divided by 16. This way, in an 8 round tournament, the top 8 will always be considered as a “top finish”. 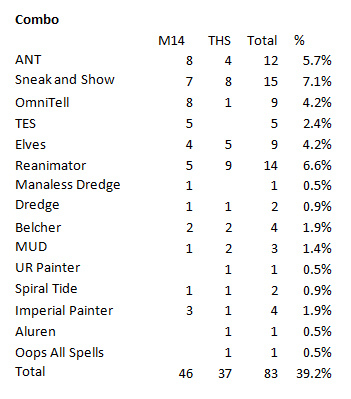 And larger tournaments will have more “top finishers.”I picked M14 as the starting point for this analysis because Young Pyromancer and the Legend rule change were the last significant changes to the format, as Theros didn’t bring anything that changed too much. Also, please note that I consolidated decks for ease of presentation (i.e. I counted Vial Maverick, Dark Maverick, and GW Maverick as “Maverick”). Please note that I consider decks like Death and Taxes and Shardless BUG as the “control” decks of the format, although they obviously have many creatures. In general, I look at the deck and ask if the general philosophy is to play a controlling game or an aggressive game and then place it in its appropriate category. Without further ado, here are the top performing decks since the release of M14. The percentages are the number of decks in the archetype divided by the total number of top finishing decks. As usual, you can see that Legacy is an immensely diverse format, with dozens of distinct archetypes in representation. Now let’s take a look at the breakdown of the top performing decks. These 11 archetypes make up just over 60% of the metagame, so I suggest you prepare for your next big event with them in mind. Let’s break down each deck and why they have been successful. RUG Delver is Legacy’s most successful deck historically, and is still putting up strong finishes. The deck has an extremely streamlined design and packs the most efficient creatures, mana denial, removal and counterspells in the format. RUG is a deck that can just nut draw you out of the game through mana denial, or dropping a Delver and countering all of your relevant spells. However, it has not done as well as it has in the past, currently representing 9% of the metagame, compared to previous eras of Legacy where it was in the double digits. Traditionally, RUG preyed upon combo decks and decks that were too slow to put up enough resistance to get through its fast clock, mana denial, and counter suite. However, looking at the other top performing decks, only Reanimator is left as a deck that RUG truly succeeds at preying upon. The other combo decks have adapted to RUG in the format (ANT has enough disruption and Past in Flames to fight through counterspells; OmniTell’s mana base is hard to disrupt; Sneak and Show can win if it resolves one spell). RUG still does fine against each of those decks, but is not immensely favored. On the other hand, the other fair top tier decks are built to prey on RUG. Shardless BUG has a fantastic package of 2-for-1’s in the form of Baleful Strix and Shardless Agent, as well as the ability to pull way ahead with Ancestral Vision, as well as Deathrite Shaman as a mana accelerant/life gain engine. Enough has been said of Deathrite that I won’t go into further detail, but suffice it to say it is the most played creature (yes, beating out Tarmogoyf) and has so much utility in almost every match-up, as well as being a must-kill for RUG. Similarly, Jund has a decent RUG match-up because it has enough 2-for-1’s and Deathrite Shamans that it is able to stabilize and take over the game, as well as running its own Tarmogoyfs. 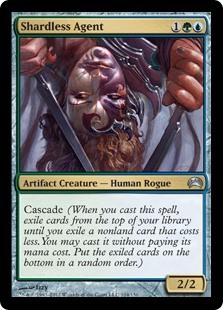 Finally, Death and Taxes attacks RUG through problematic creatures like Mother of Runes and Thalia, Guardian of Thraben. 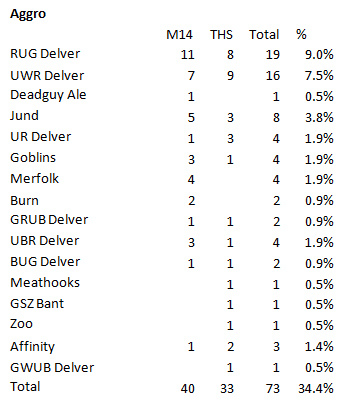 With all that being said, RUG is still putting up better finishes than any other deck in the format. I see two reasons for this. One, RUG is an extremely consistent deck and has game against everything because it plays so many counterspells and deck manipulation. Two, it is likely one of the most played decks and still does a decent job of beating the random decks in the early rounds of a tournament. Because of the aforementioned decks having game against RUG I personally believe that RUG is no longer well positioned to beat the top decks so I would not play it at a large event, but there is something to be said for its consistency and nut draws. 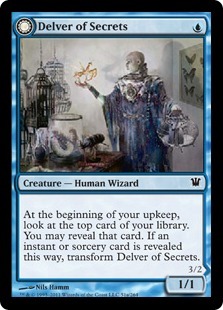 The new Delver deck on the block, UWR has had a lot of recent success for a new Legacy archetype. I am personally a huge fan of the deck as it has game against everything. 8+ removal spells for tribal decks, counterspells for combo, and Stoneforge Mystic into equipment to grind out against the fair decks. This deck does extremely well vs. other creature based decks due to Stoneforge and the gigantic removal suite. It also has access to Rest in Peace out of the sideboard, which is a beating against many of the top decks in the format. Most cards in the deck are very powerful by themselves, so this is a deck that is happy to one for one and come out ahead on card quality. Those are the reasons for its success. However, it is not perfect. Although it does not lose to any of the top decks consistently, it doesn’t beat many of them consistently either. RUG Delver, Jund, Death and Taxes, Shardless BUG, and Storm (especially TES) all have ways to interact and beat it. By playing main deck Lightning Bolts and Swords to Plowshares, your combo match-up game 1 is not great. I would say that UWR Delver is the deck to play if you are confident in your play skill and are happy grinding out a tournament without free wins against the top decks (but many free wins against the tier 2 decks). Sneak and Show is a very well-positioned deck. It is a turn 3 combo deck that is easy to pick up, and difficult to disrupt due to its own counter magic. Combo decks are doing very well right now, and Sneak and Show generally does fine in the combo mirror due to its own speed and counterspell package. The main disadvantage of Sneak and Show is that you can only play 4 Brainstorms and you lose many games where the deck just poops on itself by drawing 3 or 4 of one combo piece and 0 of the other. Certainly, there are ways around this drawback, perhaps by playing cards like Sensei’s Divining Top or Preordain. The string of recent finishes at SCG Milwaukee and at the SCG Invitational is certainly not surprising to me, especially given the caliber of players playing the deck. Sneak and Show used to struggle against tempo decks, but with the addition of Blood Moon as another “must counter” spell, Sneak and Show has evened the odds. If Blood Moon resolves, traditional tempo soft counters like Spell Pierce and Daze are nullified and the Sneak and Show player can simply combo off on the following turn. I would definitely recommend this deck (and have done so to friends entering the format), although it does eliminate a lot of Legacy’s intricacies given the simplicity and non-interactivity of the deck. Reanimator was once the deck to beat, due to the consistency of the deck with Mystical Tutor. After the banning of Mystical Tutor and the printing of Deathrite Shaman though, Reanimator has not had too many top finishes until recently. Why the change? I think it comes down to the fact that sideboard graveyard hate has gone way down due to the omnipresence of Deathrite Shaman, and Reanimator players have started playing more ways to get around Deathrite Shaman (Show and Tell, Izzet Charm) as well as Pithing Needles, Engineered Explosives, and other creative solutions in the sideboard. Furthermore, Reanimator is naturally well positioned because its main predators (RUG Delver and Miracles) have declined in popularity and Reanimator is a turn 2 combo deck that crushes other combo decks (Show and Tell, Storm) and most ‘fair’ control decks (i.e. Shardless BUG), which make up most of the format. Reanimator does struggle against Karakas decks, but Maverick has not been doing well, and Death and Taxes is not the most popular deck. Reanimator players have further adapted to this by playing targets such as Inkwell Leviathan and Grave Titan, which are immune to Karakas. Reanimator is in a fantastic position right now and I would highly recommend playing it. It is an extremely consistent turn 2 combo deck that has discard and counterspells, and that gives it an edge against most other decks in the format, especially other combo decks which are very popular and successful right now. 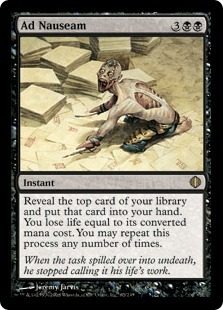 However, I see one major problem with Reanimator. There are too many hate cards that are good against it (graveyard hate, heavy counterspell package, Swords to Plowshares, anti-Show and Tell cards) so if it stays this successful, the hate will come back and the deck will stop putting up these top finishes. Until players learn to bring their graveyard hate though, I find Reanimator to be perhaps the best positioned deck in the format. Since the release of M14, Shardless BUG has outpaced its counterpart control deck, DeathBlade, significantly. Shardless simply has more card advantage and more easy to use threats than almost every other fair deck in the format (Tarmogoyf is a 2 mana investment and Stoneforge Mystic is 4, for example), and stomps most Delver strategies. I see it as the king of the decks that beat up on other fair decks, which is not a terrible place to be, given that most of the metagame comprises of Aggro and Control strategies. Yet, Shardless BUG has not done well very recently. It has a horrendous combo match-up game one, (most Shardless lists don’t even play 4 Force of Wills main deck) and although the sideboard can be tweaked to give a decent combo match-up for games 2 and 3, it’s still very much an uphill battle if you lose game one 75% of the time. 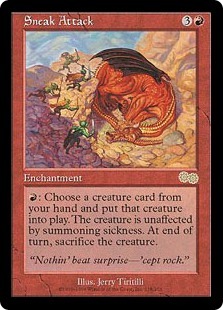 Due to the popularity and success of combo and the rise of Blood Moon, I would not play Shardless BUG as currently composed at a large tournament. I think 4 main deck Forces is a must, as well as 4 Hymns, and probably some number of Thoughtseizes as well. Adding basic lands is certainly an option against Blood Moon, but that weakens your already greedy manabase against Wasteland/Stifle. Recently, storm decks such as ANT, TES, and even Belcher have been putting up solid finishes. Storm has always been an extremely powerful, albeit difficult to pilot strategy. I attribute its string of recent finishes to Storm players getting better and having more resources to learn the deck online, as well as the popularity of the various fair decks in the format (Shardless BUG and Jund). Those decks do have ways of interacting with Storm, however Past in Flames often makes their plans of attack much weaker. Game one, Storm is heavily favored, so even when the fair decks bring in a lot of hate, Storm is still likely to win the match. Furthermore, people have been trimming Force of Wills left and right to shore up their Game 1 percentages vs. the other fair decks, and Storm simply capitalizes on that. Against the other top decks, Storm generally struggles against blue-based combo because those decks are often as fast as Storm and can also pack Force of Will and plenty of other disruption. Storm also has a fairly even match-up against Death and Taxes. It often comes down to who is on the play/draw and if the Storm player can beat a Thalia protected by Mother of Runes. Personally, I believe ANT to be in a worse position since the release of M14 due to the increased presence of Show and Tell and decreased presence of fair decks. I do however, really like TES because it is a turn faster than ANT and kills the opponent half the time before a Thalia can even hit the table. The downside to TES is that it does not play Past in Flames main deck and has a weaker late game, as well as being more difficult to pilot due to the increased lines of play from main deck Burning Wish. Elves is the only true Aggro-Combo deck in the format, with a fluid ability to switch between the two. With built-in card advantage engines of Wirewood Symbiote + Elvish Visionary, Elves also does a great way of grinding against the fair decks, as well as being able to Natural Order for Craterhoof Behemoth for the win as early as turn 2. Elves is a deck with many triggers and interactions (you can’t Wasteland their Forests effectively if they have Quirion Ranger, you can’t attack effectively through Wirewood Symbiote) and many “must-kill” creatures, so a lot of newer players stumble against Elves by missing a lot of the on board interactions. I think Elves is a decent choice, with game against the entire format. It does have a bad combo match-up because most combo decks are faster, but with enough hand disruption out of the board, it can still win. OmniTell is a slightly slower and even more difficult to disrupt version of Sneak and Show. Karakas won’t do anything vs. OmniTell, and rarely will Wasteland. On the other hand, OmniTell is more vulnerable to discard due to being a 3 card combo. I personally found assembling 2 card combos to be difficult enough, let alone three card combos, so I would recommend staying away from OmniTell. It matches up fine against most of the other top tier decks, but its inherent slowness and inconsistency make it a questionable choice in my eyes. Sneak and Show is fairly Wasteland resistant already, and you can already beat Karakas through Blood Moon and overloading on Sneak Attack, so I see no real reason to cross over to OmniTell and make your deck extremely vulnerable to discard. Leyline of Sanctity is certainly good vs. discard, but you have to have it in your opening hand and I generally dislike diluting your deck and forcing yourself to take extra mulligans. Jund is in a very similar position to Shardless BUG. Essentially, it struggles against the same decks (combo) and beats the same decks (fair creature decks). Jund is an even more all-in on the “I want to beat fair decks” than Shardless BUG, as it generally defeats Shardless BUG head to head. I would not play it if your goal is to beat combo decks, but it certainly does well vs. tempo decks and Deathrite Shaman midrange decks because it has better threats and better card advantage, without having to worry about using space in the 75 for Force of Will. You are also weaker to Rest in Peace, so I would recommend packing some Golgari Charms in the sideboard. Miracles has been on the decline since the printing of Abrupt Decay, although it still has a major presence in Magic Online. In general, the deck revolves around assembling soft locks (Counterbalance + Sensei’s Divining Top), buying time through sweepers and removal to land a Jace, and ends games with either Helm of Obedience or Entreat the Angels. Miracles is a very taxing deck to play, and needs to play cards like Misdirection due to the presence of Abrupt Decay. I would recommend Joe Lossett’s version of Miracles with flash creatures because Liliana of the Veil is a huge problem for the deck. In general though, the deck is extremely powerful but so difficult to play perfectly that I would probably avoid it unless you practice a lot. Death and Taxes is one of the most intriguing decks in the format. Every other top tier deck is part of Carsten Kotter’s triumvirate: Delver tempo decks based around counterspells and mana denial, Deathrite Shaman decks based on mana ramp and card advantage, and combo decks based around consistently killing or functionally locking their opponents out with Griselbrand on turn 2 or 3. Yet, Death and Taxes does none of these things. Instead, it attacks all of them by playing difficult to deal with spells such as Thalia, Mother of Runes, Mirran Crusader, and Mangara of Corondor. It also plays the best mana denial package in the game, with Thalia, Wasteland, Rishadan Port, and Aether Vial. Death and Taxes wins by locking out their opponents and putting them into a position where they simply can’t win, and then uses a finisher to close out the game. I think Death and Taxes is very well positioned against many of the top tier decks in the format, but struggles against turn 1 combo decks like Belcher and Punishing Fire decks, as well as creature based combo decks like Elves. Yet, if your goal is to win a Grand Prix, your focus should be beating the top tier decks and Death and Taxes does a fantastic job of doing that. Combo decks are really good right now. They usually have an even match-up against the Delver decks, and beat up heavily on the fair decks. If your goal is to do well in a large tournament, you need a solid plan to beat combo. On the flip side, fair decks like Shardless BUG should probably be avoided. People are playing DeathBlade and RUG Delver in lower numbers, so your natural prey is gone. Delver decks are in an okay position, if they can find a way to break even with the fair decks. I think UWR does a fine job of that, but RUG does not. That’s going to wrap it up for my first look at the Legacy metagame. Next time, I will plan on delving deeper into some of top underplayed strategies in Legacy (Life from the Loam, Chalice of the Void, and Miracles) as well as an update on the post-Commander 2013 metagame. It is my belief that the new Merfolk Rogue from C13 will be the best three drop in the format. It is bad against combo, however, but non-combo decks still outnumber the combo decks so it will be better than Vendilion Clique. It is a recurring source of damage, almost can’t be killed, blocks Batterskull, and holds equipment very well. It is a slower clock than Geist of Saint Traft, but simply has more inevitability, which is where the tempo decks were lacking against the other fair decks. I personally hate the card due to its non-interactivity, but because it is here, I will do my best to abuse it until it gets banned or something else changes.